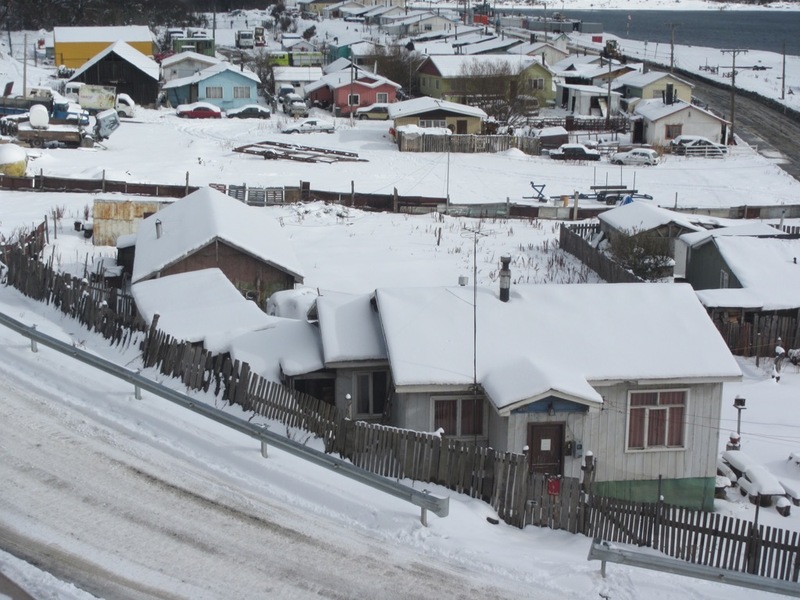 We interrupt our series of articles about the Yaghan indians of Tierra del Fuego to bring you another tale about our day to day life down here. 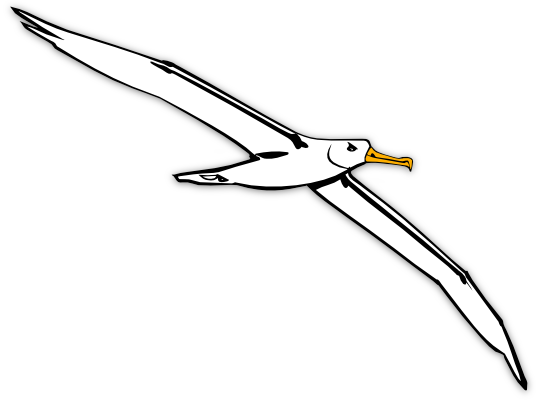 How do you picture the southernmost limit of mankind’s colonisation of this planet? Do you see snow and ice stacked up around little wooden houses? A back-drop of rugged mountains…? 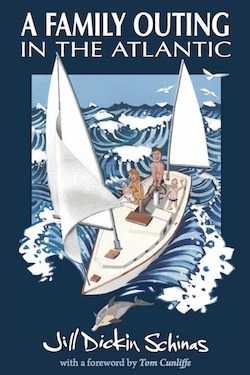 Wild winds whisking around the famous Cape and hurtling up through the channels…? 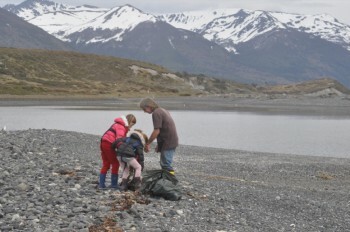 The images that these words throw up are probably fairly accurate, but they leave out one thing – and it’s a thing that we certainly didn’t anticipate before we came down here: Although Tierra del Fuego lies on the furtherest periphery of modern civilisation, and although the local population is very small, there’s still quite a bit of man-made rubbish littering the shores of the Beagle Canal. 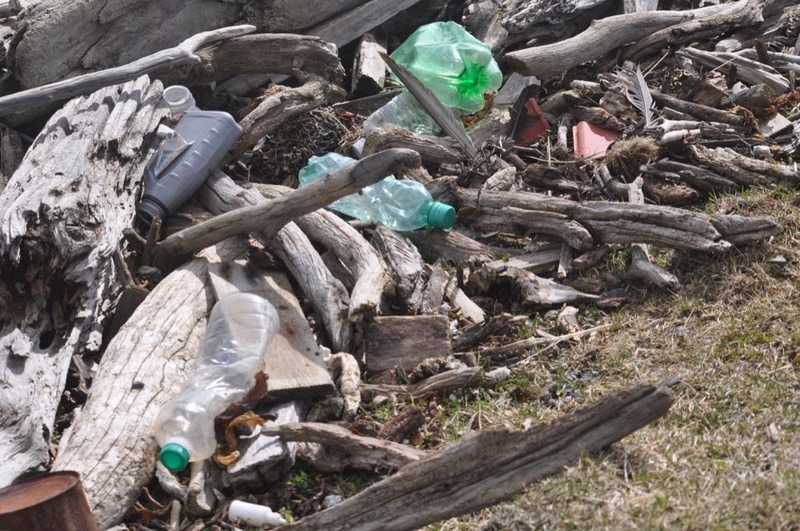 It’s sad to see that even this otherwise pristine region is marred by our poisonous cast-offs – but there you go; one can’t make an omelette without breaking eggs and one can’t run a city and a fishing industry without churning out tons of plastic junk. Or rather, it could be done, but we don’t do it. Enshrined at the heart of the Capitalist system which runs our lives is an unspoken but unquestioned creed which places financial profit before all else. Numbers in the bank matter much more to Homo sapiens than the preservation of the planet on which we and our fellow creatures all depend for our survival. And so we go on buying plastic-wrapped crap; and the fish-eaters amongst us keep on buying seafood from people who couldn’t care less about the environment and who litter the sea with deadly snares and equally deadly bits of plastic and polystyrene. And although you and I put our rubbish in the appropriate bins – sending it off with prayers and well-wishes for a new life as recycled plastic-weatherboarding or ‘fleece’ garments – the fact of the matter is that almost all of the stuff that we buy, use, and dump spends the ever-afterwards littering some part of the natural world; and in Tierra del Fuego there’s a chance that our plastic rubbish will end up in the sea. 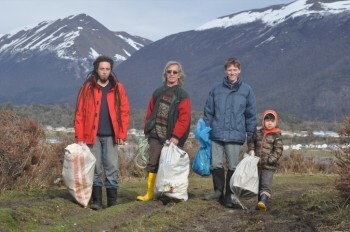 To be fair, the Chileans make every attempt to bury the waste which accumulates as a result of the little town of Puerto Williams, and the Argentinians, on the opposite side of the canal at Ushuaia, take even better care. 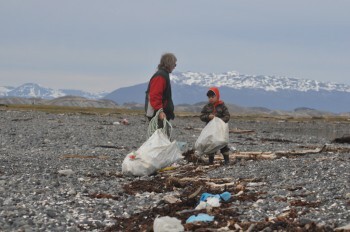 (The Argentinians actually recycle a small part of their rubbish, whereas there are no recycling facilities in the world’s most southerly town.) Despite this, as I say, there is still a fair amount of litter strung out along each windward facing shore of the Beagle Channel, and I’m reasonably sure that it’s not derived exclusively from the few fishing boats which ply these waters. Plastic bottles and bottle tops, toothpaste tubes, cigarette lighters, and broken plastic toys are some of the commonest things that we’ve found amongst the scraps of net and bits of fishing float. Often there are plastic sacks in amongst the flotsam, and so we’re able to use these to gather up some of the junk. On one recent occasion I was put to shame by my opposite number aboard the Alaskan yacht, Galactic. 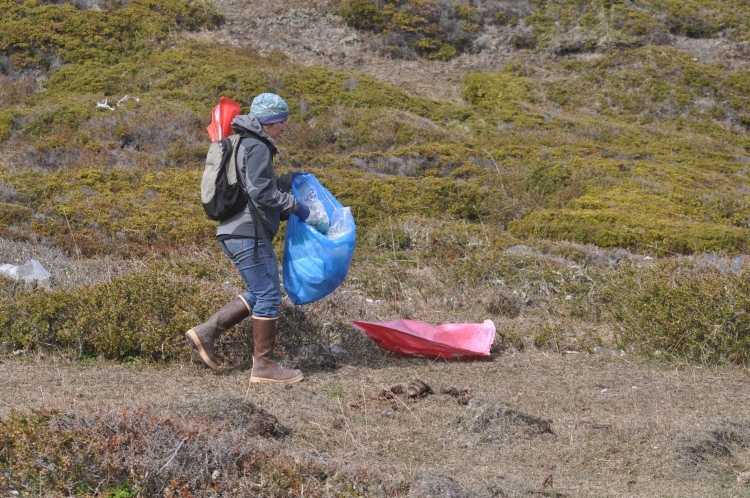 While I faffed about taking photos of the wildlife and the scenery, Alisa grabbed two such bags and filled them with other rubbish; and then she lugged them up a steep hill and carried them two miles to the nearest bin. It was delightful to see how Alisa’s sons, nine year old Elias and five year old Eric, joined in with the litter-picking project without needing to have anything explained. 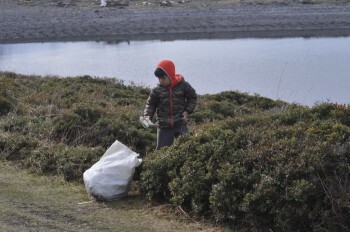 Since their parents are both ecologists by profession it’s no surprise to find that the boys are being brought up with a sound understanding of environmental concerns. By contrast, on another occasion we were walking with some Chilean friends, and their knowledge of the situation was distinctly lacking. 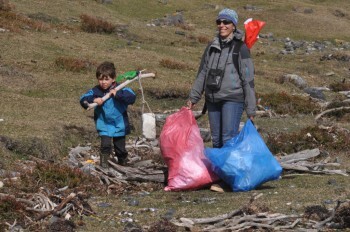 Carol and her sisters had no understanding of why we would want to gather up these useless pieces of rubbish; so we told them. Carol’s six year old son, Nico, grasped the idea in a flash. 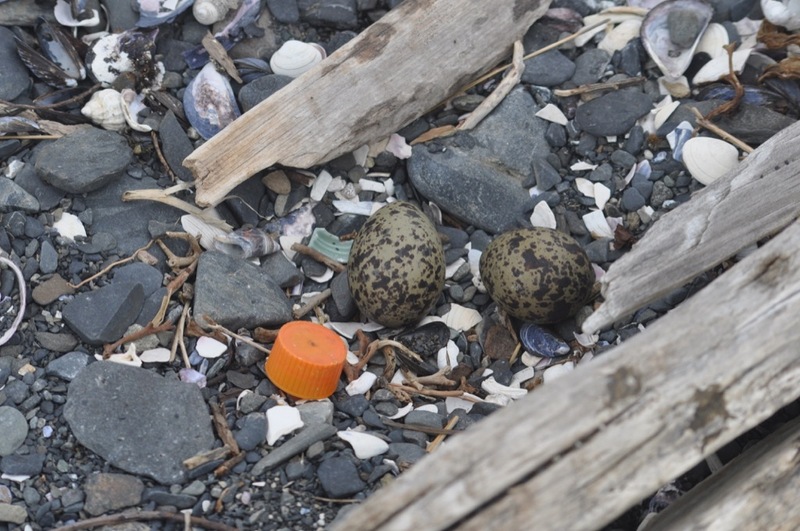 Having heard that the gulls, nesting nearby, will feed plastic bottle-tops and other little bits of plastic to their chicks, he was vigilant in picking up every one that he came across. Then we explained to Nico that even big things such as bottles eventually break down into tiny pieces which get into the food chain, so he began to gather up those, too. Finally, we explained about the evils of polystyrene. It breaks down into little round balls which look very like fish eggs, and so the birds and the fish and crabs gobble them up. King crab, or centolla, is a local delicacy and – as we pointed out – if you eat it there’s a chance that you might end up eating polystyrene too. After that, we could hardly get Nico to come home, he was so determined to gather up every last piece! Definitely an environmentalist in the making – and the experience confirms what we are always being told: Education is the key to almost every problem, including that of saving our seas. Impressed by this success, we subsequently took two little French girls to the same beach and gave them the same lesson. The fruits of an impromptu litter gathering session. 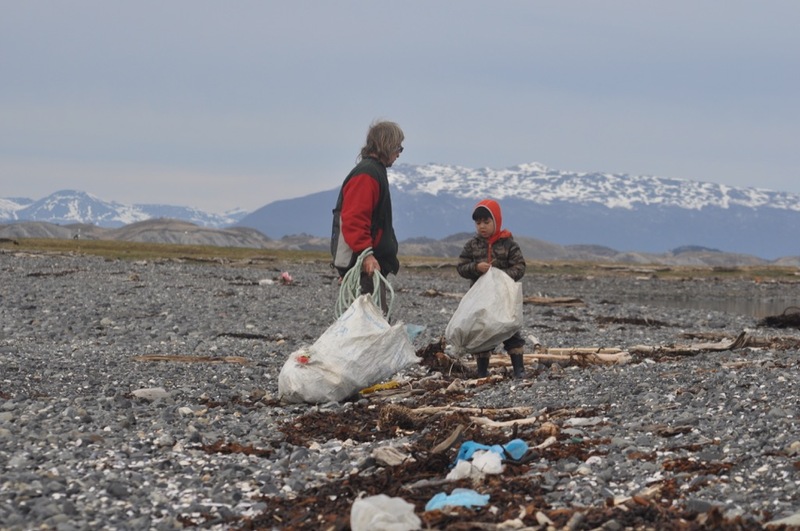 In future we’re going to carry a couple of dustbin bags with us whenever we go walking on the beach – although, of course, when the litter includes plastic sacks it’s obviously better to make use of them. Pop back in about a week’s time for the next gripping instalment in our Tale of Exploration and Indians!